For Tier 6 pension estimate, I completed Request Form RS 6030 but there is no instruction on where or how to send it? Tier 6 members must have at least 10 years of service credit to be eligible to retire. In order to submit a Request for Estimate form (RS6030), you must be within 5 years of retirement eligibility. If you have at least 5 years of service credit, you can mail the RS6030 to the address at the top of the form. If not, you can email your questions about retirement to our customer service representatives using our secure email form. One of our representatives will review your account to address your questions. Filling out the secure form allows us to safely contact you about your personal account information. Please allow five to seven business days for a response. Thank you for the information. Maybe the 5 year requirement should be stated somewhere. It could save a lot of time. I am at top of grade and have been getting longevity bonuses. 1. Why are my reported earnings in my annual statement so different than the job rate + longevity bonus? 2. Which is used in calculating my FAS, my reported earnings or job rate + longevity bonus? 3. Where can I find my current reported earnings? The NYSLRS social media team does not have access to your personal account information, however we can give you this general information. The salary information in your Member Annual Statement (MAS) is provided to NYSLRS by your employer and represents earnings reported to us during the fiscal year (April 1 – March 31), so it may not match your W-2’s or paystubs. If you feel your salary information is not correct, please contact your payroll office. If there is an error, they will need to make the correction. For more information, check out our Understanding Your Member Annual Statement page. While I appreciate a timely response, this does not reply to my questions. I asked about the annual statement vs. the pay rate. Both of these are in the 4/1 – 3/31 time frame. Let me try this. Will the Retro Regular Pay and PEF DRP payments be applied to the FAS calculation on the date we received the money, or will it be applied historically on the date we would have received it, had it not been withheld? And, are my current reported earning available on line or do I have to wait until they are mailed to me. Your employer reports earnings as they are paid to you. If the earnings provided on your Member Annual Statement aren’t what you expected, you should check with your employer. Your statement should reflect retroactive and longevity payments in the fiscal years that you received them. However, when you retire, generally, retroactive payments — such as a lump sum payment from your employer following a newly negotiated union contract — are applied to the pay periods when they were earned. So, they would increase your FAS if the time period when you earned that money (when you would have received it, if it had not been withheld) is part of your FAS period. Unfortunately, previous salary information is not available in the current version of Retirement Online, though future releases will include salary information as well as an expanding list of features and functionality designed to give you access to and help you manage a wide variety of retirement information. We apologize for the inconvenience, but if you have specific questions about your account, you can email our customer service representatives using our secure email form. One of our representatives will review your account and respond to your questions. Filling out the secure form allows us to safely contact you about your personal account information. That’s exactly what I wanted to know. Thanks so much!! Any word on early retirement incentives for tier 4 employees in 2018 ,or 2019? At this time, we’re not aware of any discussions about statewide retirement incentives. The New York State Legislature (not NYSLRS) occasionally enacts these retirement incentive programs, which are approved by both houses and signed into law by the Governor. The Retirement System administers programs that are signed into law. We’ll notify your employer if the Legislature makes a State incentive program available. Is there an on-line pension calculator? They’re used to be prior to the website changing you could input your years/salary – ERS – date of retirement and it gave you an estimate…is that still available, if so, where? 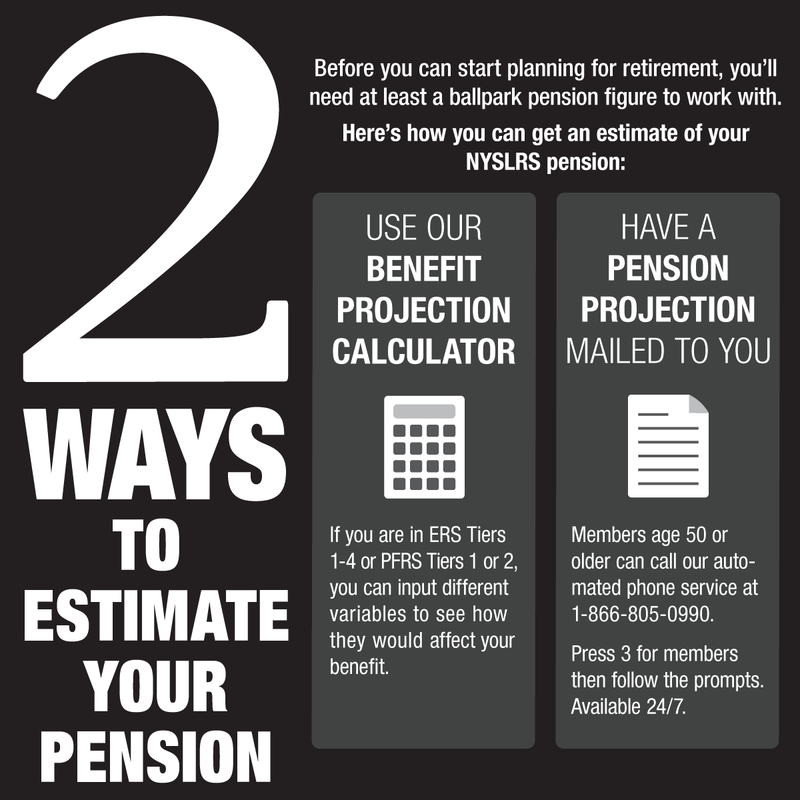 Yes, most NYSLRS members can use our Benefit Projector Calculator. The calculator provides estimates based on information you enter. By changing each variable (date of retirement, average salary, beneficiary information), you can see the impact it would have on your pension benefit.